“It is very important that we have the ability to make sure that we are doing everything we can to put veteran guys down there, who have seen this already, to make sure they understand what they are looking at so we don’t have an overreaction,” Belmar said. The county police chief – whose department has taken over security at Ferguson protests alongside the Missouri State Highway Patrol – was not able to reveal any concrete information about the ongoing investigation. "I cannot tell you that an arrest is imminent...there is certainly no one in custody,” Belmar said at a news conference. Investigators are still trying to work out the type of handgun that was used during the incident, and whether the shooting was deliberate. “I wouldn’t characterize it as a miracle shot...Bottom line is, there were many officers standing together. If we want to believe, there were three shots fires, two of them did strike, but one missed,” the police chief said. Belmar said the two officers who were shot are doing “remarkably well” and are in good spirits and optimistic about their recoveries. Police are not revealing their identities. The officers were shot during a protest outside the Ferguson Police Department. The shooting occurred as the rally was subsiding early on Thursday. 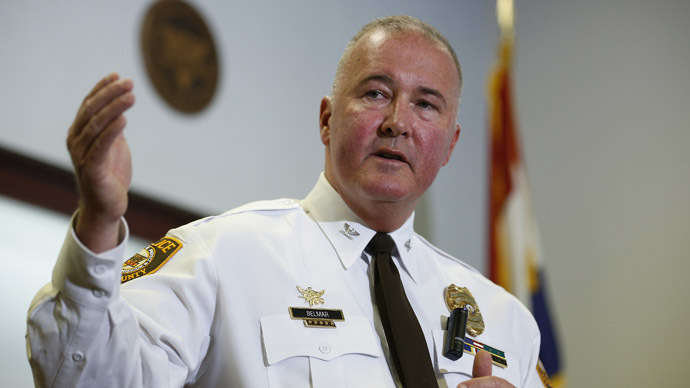 A 32-year-old officer from Webster Groves was shot in the face and a 41-year-old from St. Louis County was shot in the shoulder, Belmar told journalists on Thursday. Footage has emerged showing the moment the shots were fired. Despite the video's low resolution, the sounds of gunfire are distinctly heard, as well as the groaning of a man who was hit. The protest outside the department began after the resignation of Ferguson Police Chief Tom Jackson on Wednesday. He is the sixth city official to step down in the wake of last week's Justice Department report which lashed out at Ferguson's courts and police department for racial prejudice. The US saw a wave of large-scale protests against police brutality following the shooting of unarmed black teen Michael Brown by Ferguson officer Darren Wilson in August last year. In November, a grand jury decided not to indict Wilson. Ferguson protesters “stand with officers and their families and hope that they have a fast recovery,” activist and Ferguson Commission member Rasheen Aldridge told RT’s Alexey Yaroshevsky. “We are not about any violence. We know that the best way to get our message across is to be a non-violent movement and that is the way we are going to create the positive change,” Aldridge said.